This is my new commuting bike. It is a Canadian made Sekine from the mid to late 1970s. 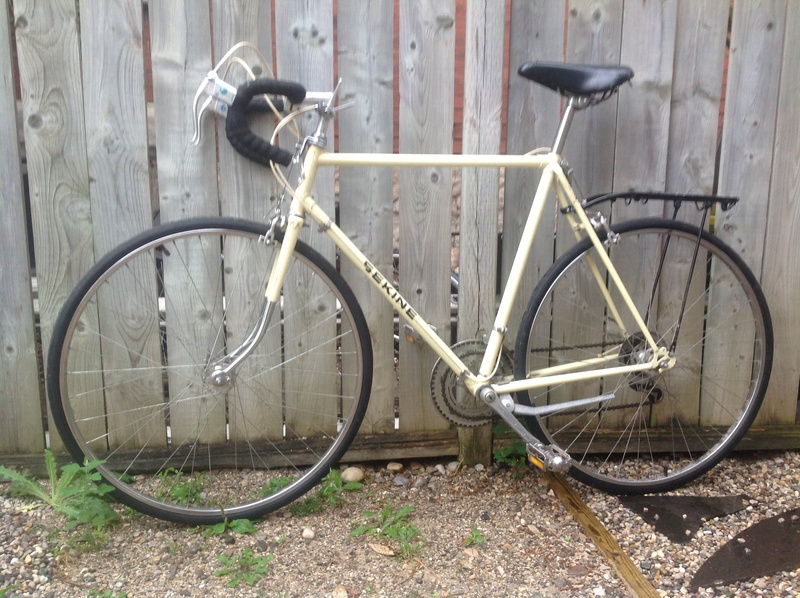 I have been looking for a vintage road bike to use as a commuter. I thought I had one back in the spring. I found a great Peugeot at Recycle Cycle in June. I rushed home and talked my wife into getting it for me, for Father’s Day. Unfortunately, when she got down to Recycle Cycle, it had been sold. I kept checking Recycle Cycle and Kijiji over the summer, but didn’t find anything that interested me. I have many reasons for wanting a vintage road bike. I have been riding my Surly Pacer back and forth to work, which has been great, because it is a very fast, smooth-riding bike. I take it inside at work. However, I feel insecure about leaving it locked outside, if I have errands to run after work. Bicycle theft seems to be on the rise! I’ve tried commuting with other bikes (hybrids, mountain bikes with road tires, etc. ), but everything seems to add 15 to 20 minutes to my overall commute time. Soon, I end up back on my road bike, worrying about it being stolen. The Sekine solves my problem: the financial investment was small, but it’s still a pretty quick ride. I haven’t tested it out on my commute yet, but when I do, I’ll let you know how it compares to my Surly. I am hoping it won’t attract too much attention from thieves, because it is old. I also really like the idea of riding a vintage bike. It seems kind of retro-cool. I got the Sekine at the local police auction here in Waterloo Region. That is good news for me, but bad news for somebody else. It’s good news for me, because I love this bike! It’s bad news for someone else, because being at the auction means it was stolen. I’m sorry for the guy who got his bike stolen. I am also amazed at the number of bikes at the auction. There were over 200! Over 200 bikes were stolen, in the Waterloo Region, and not recovered by their owners. Make sure you lock up your bike! I’ve done quite a bit of reading about Sekine’s over the last few days. Sekine was a Japanese company, that manufactured bikes in Manitoba in partnership with one of Canada’s First Nations. A lot of the information was pretty interesting, but I’ll save it for later. Based on what I read, I think the bike is a Sekine SHC 271. It is in pretty good shape. The tires were starting to break down, so I replaced them and the tubes. The only other thing that I replaced was the bar tape, because the previous owner had put foam grips on the bars. I adjusted the gears, stripped the chain and lubed it. It rides like a dream! The wheels are true and the original cables still work well enough, although, I may end up replacing them eventually. All in all, I am very happy with my new bike! Here is a link to a website with more information about Sekine’s. They have quite an interesting story. Sure, it’s a good idea to lock up your bike, but the number of stolen bikes recovered by police but not returned to their owners is an even better reason to record your serial number and report it stolen if it goes missing. Toronto has a bike registry so you can register in advance (https://webapp1.torontopolice.on.ca/BicycleRegistry/Submit) – maybe it’s time for Waterloo to set one up as well? Assuming of course, that they can afford to lose all that income from the legal sale of stolen bikes! Good points Peter! I’ve taken pictures of myself with my bikes and pictures of the serial numbers. I’m glad that bike ended up in a good home. I was seriously eyeing that up at the auction, it was the only bike that interested me. My dad had one just like it when I was young then he gave it to a friend who needed it to get to and from work and I’ve been looking for a replacement ever since. Thanks, Chris! It was the bike that interested me the most too.